Historically, GPU-based HPC applications have had a substantial memory bandwidth advantage over CPU-based workloads due to using GDDR rather than DDR memory. However, past GPUs required a restricted programming model where application data was allocated up front and explicitly copied into GPU memory before launching a GPU kernel by the programmer. Recently, GPUs have eased this requirement and now can employ on-demand software page migration between CPU and GPU memory to obviate explicit copying. In the near future, CC-NUMA GPU-CPU systems will appear where software page migration is an optional choice and hardware cache-coherence can also support the GPU accessing CPU memory directly. 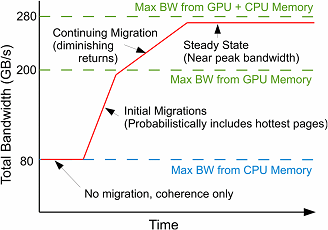 In this work, we describe the trade-offs and considerations in relying on hardware cache-coherence mechanisms versus using software page migration to optimize the performance of memory-intensive GPU workloads. We show that page migration decisions based on page access frequency alone are a poor solution and that a broader solution using virtual address-based program locality to enable aggressive memory prefetching combined with bandwidth balancing is required to maximize performance. We present a software runtime system requiring minimal hardware support that, on average, outperforms CC-NUMA-based accesses by 1.95 ×, performs 6% better than the legacy CPU to GPU memcpy regime by intelligently using both CPU and GPU memory bandwidth, and comes within 28% of oracular page placement, all while maintaining the relaxed memory semantics of modern GPUs.